File2Cart One-Time Import is used to move new entities to your store database and update the existing catalogue only once. With the help of File2Cart you can import your products, their images, categories and manufacturers. File2Cart supports the unlimited number of products, categories and manufacturers. Also you can import 5 images: the main one and four additional. Note! Not to face problems while importing, be sure that your file meets all the requirements. To make your import smooth see file requirements. To begin One-Time Import you need to select your target cart type (from the drop-down menu), provide URL and download connection bridge. You will need to upload the bridge on your target store. The next stage is a field mapping. The required fields are: Product ID (number, SKU, etc. ), Name, Description and Price. There are two optional fields: Categories (with delimiters) and Images. File2Cart also offers you to map over 20 additional fields from Languages to Weight and Meta Description. Then the service will perform Pre-Import Data Check and retrieve all data from a file. You can see the results of this procedure, i.e. number of products and categories that were successfully retrieved or ignored. When everything is checked and retrieved, the Demo Import begins. 10 products will be imported to your store for free. You can check the result on your target store and if everything is alright you only need to confirm Full Import. Generally, the price of One-Time Import depends on what file type you want to import, to what shopping cart and how many entities you have. For example, you can import a CSV file with 1000 products to Magento for only $39. As for the payment, you can pay for import with you credit card or PayPal. 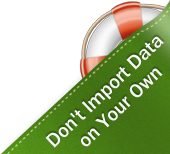 You can order Data Import Assistance. It means that File2Cart Support Team will perform import on the highest level for you. It will definitely minimize risks and save your time. You can request Customized Import Service. File2Cart technical engineers will modify everything, so it will be properly displayed on your store. As you can see, everything is effortless so, just register and enjoy all benefits of a rapid and simple import process with File2Cart right now!